Padres to Beat Marlins? Maybe? Just a smidge of a chance possibly? Depressing state of affairs. That line up is horrendous. The first week or so, I saw the so-called sensible bloggers and Tweeters pulling out the #SSS and the continuous snarky “it’s a little early to get worried about the audience #snark #firstweek”. Well the whole #SSS thing is now a pretty big sample size. Some would even say that we have a statistically significant sample to start making longer term judgements. And that judgement is this is not a major league lineup. I remember the media pointing out that last season’s Marlins lineup sans Stanton during his injury was one of the worst major league lineups they’ve seen (Greg Dobbs at 1B anyone?). This lineup is worse (and Yonder is worse than Greg Dobbs). It is hard to win when your team is starting 4 players with sub .200 averages and your team has pretty much no power. The bigger issues are related to how long they can keep pushing those guys out there. I mean, at this point, would the team be that much worse trying out Francoeur in RF? To some degree, the team put it’s money behind Venable and Gyorko with extensions, and it’s biggest trade to date was to acquire Grandal and putrid Yonder Alonso, so it’s tough for Byrnes to admit that he totally screwed up and is sending them down to the minors/benching them/releasing them/sending them to Abu Dhabi in an adorable box with Nermal. Him acknowledging his errors is akin to him getting shoved out the door here, so don’t expect to hear him on 1090 admitting them. I’m not sure where this team can go at this point. The TV team and radio team keep hyping Carlos Quentin’s return like he’s Roger Maris in 1961. He’s not. He’s an above average hitter with a little pop, but he’s no Jose Abreu, and doesn’t have the skills to carry this team on his shoulders (especially considering he only plays 2 out of 3 games when healthy). Get used to more 2-1, 3-1 games that go to extra innings, this team’s offense is not going to light it up. 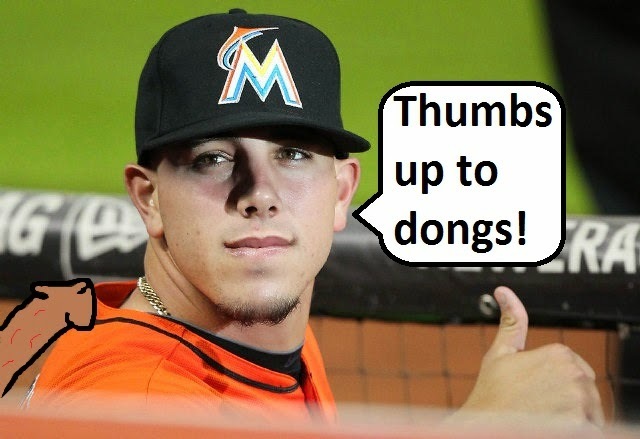 And playing Jose Fernandez tonight won’t help. But hey, at least they cut the price on the Cardiff Crack sandwich, right? And beer! That’s where this team’s management focus is, and likely will continue to be the focus in the near future. ← Degarfinkelization: Why Can’t We Keep The Good Stuff?